It’s not because they’re more moderate than Democrats. Bernie Sanders before his speech to the 25th annual National Action Network convention in New York on Thursday. During the 2004 presidential primaries, former Vermont Gov. Howard Dean made headlines by asserting that he represented the “Democratic wing of the Democratic Party.” His support in the New Hampshire primary was true to those words: He performed better among self-identified Democrats (29 percent) than among independents (23 percent). That’s not necessarily surprising; since self-identified Democrats are more liberal than independents, we’d expect a candidate from the left to do better with them. Twelve years later, another presidential candidate from Vermont is seeking the Democratic nomination. Like Dean, Vermont Sen. Bernie Sanders aims to outflank his opponent from the left. But unlike Dean, Sanders does much better among independents than among Democrats. In New Hampshire, for instance, Sanders won Democrats by 4 percentage points while winning independents by nearly 50 percentage points, a split we’ve seen repeatedly since then.1 Some of Sanders’s strongest performances in primaries have come in places such as New Hampshire, Michigan and Wisconsin, states whose rules allow independents to vote in either primary. In fact, to date Sanders has compiled an unexpected record, performing very well in caucuses but having won just a single closed primary (Oklahoma’s). So why is Sanders doing so well among independents? It appears to be driven not by their ideology so much as their dislike of partisan politics. And that has implications for Sanders’s prospects in the upcoming primaries in New York, Pennsylvania, Connecticut and Maryland, all of which are closed to non-Democrats. Understanding why Sanders does so well among independents in the Democratic primaries can also give us hints about his appeal to moderate voters should he make it to the general election. First, though, it is critical to understand the voters who call themselves independents. For one thing, independents are Americans who are less excited to acknowledge a connection to the two major parties. As a recent book by political scientists Samara Klar and Yanna Krupnikov shows, Americans identify as independents partly to distance themselves from the negative connotations of partisanship. Given the political rancor of recent years, it’s no surprise that the share of Americans identifying as “independent” has been at or near its all-time highs. Still, not all independents are alike. To understand why, let’s take a brief detour into how partisan identification is commonly measured. Pollsters typically ask two questions to assess partisanship. They first ask if a voter would call herself a Democrat, Republican or independent. For those who pick one of the major parties, a follow-up question then asks whether the voter would say her connection to the party is “strong” or “weak.” For those who don’t initially pick a party, pollsters then ask if they lean toward one of the parties. As political scientists have long known, a sizable number of voters who initially term themselves “independents” are still willing to say that they are closer to one of those two parties. And those “closet partisans” tend to vote a lot like their counterparts who more quickly affiliate with one of the parties. In the most recent Gallup poll, 38 percent of respondents termed themselves “independents” at first. But when pushed, just 8 percent of all respondents were unwilling to admit an affinity for one of the two parties. Thanks to the 2007-16 Institute for the Study of Citizens and Politics Panel I conducted with Diana Mutz and other colleagues, we can home in on exactly who these closet Democrats are. More than 500 people in the panel’s 2012 post-election wave identified as “strong Democrats” — and of them, less than 2 percent reported backing Mitt Romney. By contrast, 13 percent of the “weak Democrats” supported the Republican nominee, and just 7 percent of the independents who leaned toward the Democrats did so.2 So when it comes to vote choice, independents who lean toward the Democrats are less likely to back GOP candidates than are weak Democrats. These leaners don’t call themselves Democrats, but they vote like other Democrats. That said, the 2016 wave of the data — collected in late January and early February — reinforces what the exit polls indicate about Sanders’s support among voters who call themselves independents but lean toward the Democrats. In our poll, Sanders won 26 percent of both the strong and weak Democrats, but he took home 43 percent of the independent leaners, beating Hillary Clinton among that group by 10 percentage points. 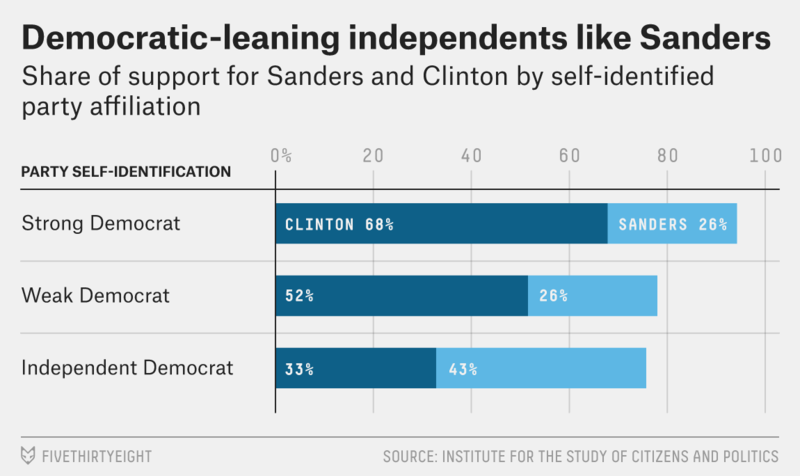 Sanders’s advantage among independents who lean Democratic is real, as the chart just below illustrates. But where does it come from, and what might it mean? In part, Sanders’s support among independent leaners is a product of the demographics of his coalition generally. Among Democrats and independents who lean Democratic, the independent leaners are more likely to be male, white and higher-income — and at the same time, they have less positive views of President Obama.3 In short, the demographics and attitudes that tend to predict being an independent who leans Democratic are those that predict Sanders support. Still, Democratic leaners are not just Democratic identifiers by another name. In 2012, they were less pro-Obama and more likely to describe themselves as “very critical” of our political system when compared to weak Democrats.4 Their identities have real-world consequences in elections, too. Of course, what voters tell pollsters about their partisan identification is not the same as their formal party registration status. In fact, many states do not register voters by party at all. Still, using the same data, I can compare Democrats and Democratic leaners’ partisan identification with their 2012 party registration status. Nationwide, 46 percent of people who call themselves weak Democrats were formally registered with the Democratic Party. Among those who call themselves independents who lean Democratic, the number is just 15 percent. (Looking at only states with closed primaries:5 74 percent of weak Democrats are registered Democrats, and 33 percent of independents who lean Democratic are.) So in states with closed primaries, a critical bloc of Sanders’s supporters must re-register as Democrats before they are eligible to back him in the primaries. As the primary calendar switches to northeastern states, which tend to have closed primaries, that helps Clinton substantially. In New York, for instance, the deadline to change parties was back in October. Thinking ahead to November, does Sanders’s advantage among independents who lean Democratic mean he would have a greater appeal with moderate voters? Sanders does win the backing of some people who think Obama is too liberal, as well as some who think he’s too conservative, possibly because such voters are disproportionately anti-Clinton. That said, independents who lean Democratic are not a good barometer of independents overall. As we saw above, they are not exactly a swing constituency. Another way to demonstrate that is to look at respondents’ ideological self-placement on a seven-point scale when breaking them out by their candidate choice and partisanship, as the chart below does. It shows how liberal or moderate the two candidates’ supporters are for each partisan category. 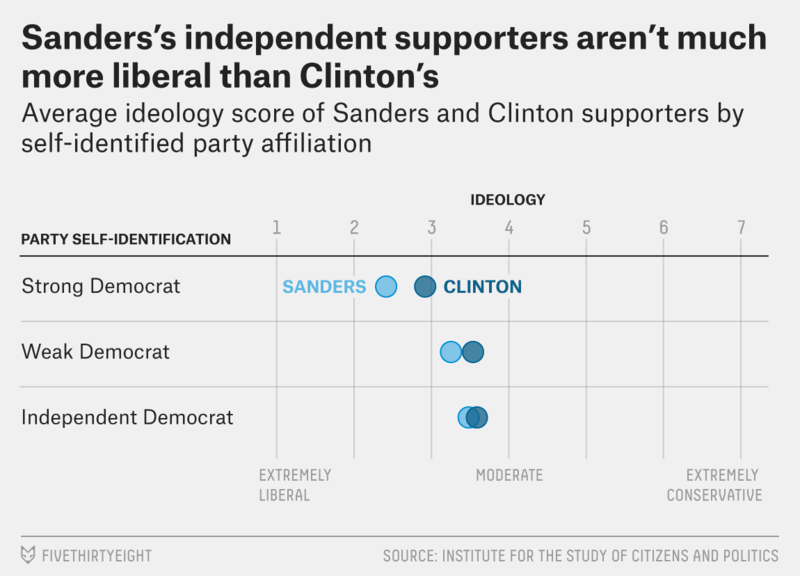 The first point to take away from this is that Sanders supporters are always more liberal than Clinton supporters — and that among strong Democrats, the difference is quite pronounced. Second, the ideological differences between weak Democrats and Democratic leaners are quite modest. On average, the independents who lean toward both the Democrats and Sanders put themselves at 3.48 on the ideological scale, which is between “slightly liberal” (3) and “moderate” (4). Comparable Clinton backers fall at 3.59, putting them slightly closer to “moderate.” So Sanders’s strength among independent leaners isn’t driven by strength with moderate voters. In fact, as Democratic voters become more moderate, they become slightly more likely to back Clinton. In a bivariate regression, for every 1-point increase in conservatism, Democrats become about 2 percentage points more likely to support Clinton. It’s critical not to confuse “independents” with “moderates.” Sanders’s career itself underscores that point: He long called himself an independent, even while compiling a very liberal voting record. Sanders has demonstrated a real outsider appeal that does better among people with a similar profile, people who lean left but are wary of calling themselves Democrats. But appealing to people who are especially disaffected politically is a double-edged sword: It wins votes disproportionately among people less likely to be registered as Democrats, putting Sanders at a disadvantage in closed primaries such as New York’s and Pennsylvania’s. We should also avoid reading too much into Sanders’s support among independent leaners in terms of how he’d fare in November: The independents who vote in party primaries are in no way representative of independents generally. Likewise, in Ohio, Sanders won 66 percent of independents but just 35 percent of Democrats. To make this statement, I looked at all Democratic identifiers and leaners as of the 2016 wave of data and then used a regression to see which attributes differentiated the party leaners, using basic demographics and a 2012 measure of attitudes toward Obama. To be precise, weak Democrats in 2012 rated Obama at 67.9 on a 100-point scale, while independents who leaned to the Democrats rated him at a 63.9. When comparing those two means using a t-test, the corresponding p-value is 0.02. Similarly, the average score on a question about whether respondents feel “very critical” of our political system was 3.33 (on a 1-5 scale) for weak Democrats and 3.56 for Democratic leaners. That difference is also significant, with a t-test yielding a p-value of 0.003. Some contests fall somewhere between open and closed, but here I’m counting Arizona, Connecticut, Delaware, Florida, Kansas, Kentucky, Louisiana, Maryland, New Mexico, New York, Oklahoma, Oregon, Pennsylvania and Washington, D.C., as closed. Defining the set differently leads to slightly different numbers.